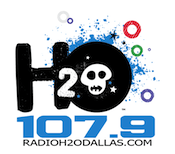 Univision has flipped Spanish Oldies “Recuerdo 107.9” KESS Lewisville/Dallas has flipped to Hispanic CHR “Radio H2O“. The flip looks like it took place at 12:30pm local time. The music so far is predominantly English with a few Spanish songs mixed in. The station is branding itself with H20 standing for “Hispanic 2.0”. Univision recently ran an “H20 Music Festival” in Dallas featuring a mix of English and Spanish artists including Juanes, Snoop Dogg, Gym Class Heroes, Weezer, Paulina Rubio, Tiesto and Damian Marley. A similar festival will be held in Los Angeles in August. Is this the first of many similar Radio H20’s? Univision has registered domains for every market is currently operates stations such as: RadioH20Chicago.com, RadioH20NewYork.com, etc..
Two other Univison Dallas stations debut new formats as well. Regional Mexican “La Jefa” moves from 99.1 KFZO Denton to 107.1 KDXX Benbrook. 107.1 had been simulcasting “Recuerdo” with 107.9. 99.1 debuts as Spanish AC “Maxima 99.1“. Univision does that with their rimshots in many markets every year or two. It wouldn’t be much to go out on a limb to except a shakeup at their Phoenix or Bay Area stations next. Wasn’t this format called CASA 106.7 a few years back and that didn’t work? Casa was a similar concept. H20 seems to be much more focused on English music and presentation while still targeting a Hispanic audience. Hopefully it works. The bilingual Hispanic audience has been overlooked for quite some time.